We theoretically propose a double quantum dots (QDs) ring to filter the electron spin that works due to the Rashba spin–orbit interaction (RSOI) existing inside the QDs, the spin-dependent inter-dot tunneling coupling and the magnetic flux penetrating through the ring. By varying the RSOI-induced phase factor, the magnetic flux and the strength of the spin-dependent inter-dot tunneling coupling, which arises from a constant magnetic field applied on the tunneling junction between the QDs, a 100% spin-polarized conductance can be obtained. We show that both the spin orientations and the magnitude of it can be controlled by adjusting the above-mentioned parameters. The spin filtering effect is robust even in the presence of strong intra-dot Coulomb interactions and arbitrary dot-lead coupling configurations. With the rapid progress in miniaturization of the solid-state devices, the effect of carriers’ spin in semiconductor has attracted considerable attention for its potential applications in photoelectric devices and quantum computing [1, 2]. The traditional standard method of spin control depends on the spin injection technique, with mainly relies on optical techniques and the usage of a magnetic field or ferromagnetic material. Due to its unsatisfactory efficiency in nano-scale structures [1, 3, 4], generating and controlling a spin-polarized current with all-electrical means in mesoscopic structures has been an actively researched topic in recent years. The electric field usually does not act on the spin. But if a device is formed in a semiconductor two-dimensional electron gas system with an asymmetrical-interface electric field, Rashba spin–orbit interaction (RSOI) will occur . The RSOI is a relativistic effect at the low-speed limit and is essentially the influence of an external field on a moving spin [6, 7]. It can couple the spin degree of freedom to its orbital motion, thus making it possible to control the electron spin in a nonmagnetic way [8, 9]. Many recent experimental and theoretical works indicate that the spin-polarization based on the RSOI can reach as high as 100% [7, 10] or infinite [11–13], and then attracted a lot of interest. Recently, an Aharnov-Bohm (AB) ring device, in which one or two quantum dots (QDs) having RSOI are located in its arms, is proposed to realize the spin-polarized transport. The QDs is a zero-dimensional device where various interactions exist and is widely investigated in recent years for its tunable size, shape, quantized energy levels, and carrier number [14–16]. A QDs ring has already been realized in experiments  and was used to investigate many important transport phenomena, such as the Fano and the Kondo effects [18, 19]. When the RSOI in the QDs is taken into consideration, the electrons flowing through different arms of the AB ring will acquire a spin-dependent phase factor in the tunnel-coupling strengths and results in different quantum interference effect for the spin-up and spin-down electrons [10, 13, 20, 21]. In this article, we focus our attention on the 100% spin-polarized transport effect in a double QDs ring. As shown in Fig. 1, the two QDs embedded in each arms of the ring are coupled to the left and the right leads in a coupling configuration transiting from serial (λ = 0) to symmetrical parallel (λ > 0) geometry. We assume that the RSOI exists only in the QDs and the arms of the ring and the leads are free from this interaction. Furthermore, the two dots are assumed to couple to each other by a spin-polarized coupling strength where t c is the usual tunnel coupling strength, σΔt may arises from a constant magnetic field applied on the junction between the QDs , and the phase factor ϕ R is induced by the RSOI in the QDs. where the spin-dependent phase factor ϕσ = φ−σϕ R , with ϕ R = ϕ R 1−ϕ R 2, this indicates that the tunnel-coupling strength only depends on the difference between ϕ R 1 and ϕ R 2, and then one can assume that only one QD contains the RSOI, making the structure simpler and more favorable in experiments. The phase-independent tunnel-coupling strength is Γ = Γ L + Γ R , with Γα = 2π|t|2ρα, and ρα is the density of states in the leads (the energy-dependence of ρα is neglected). and then the total transmission T σ(ɛ) for each spin component can be expressed as The linear conductance G σ(ɛ) is related to the transmission T σ(ɛ) by the Landauer formula at zero temperature , G σ(ɛ) = (e 2/h)T σ(ɛ). In the following numerical calculations, we set the temperatureT = 0 throughout the article. The local density of states in the leads ρ is chosen to be 1 andt = 0.4 so that the corresponding linewidth is set to be the energy unit. 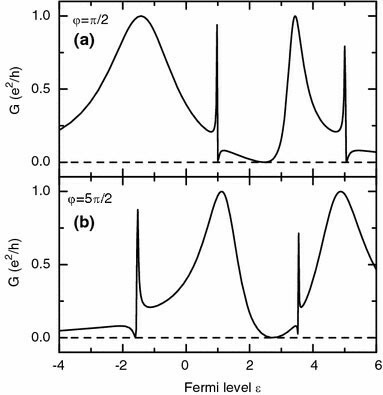 Figure 2a–c shows the dependence of the conductance G σ and spin polarization on the Fermi level ɛ for λ = U = 0 and various Δt. The two dots now are connected in a serial configuration and the conductance of each spin component is composed of two Breit-Wigner resonances peaked at respectively [18, 21]. Since the phase factors originating from both the magnetic flux and the RSOI do not play any role, the device is free from their influences. When Δt = 0, the spin-up and spin-down conductances are the same and the spin polarization p = 0 as shown by the solid lines in the three figures. With increasing Δt, the distance between the spin-up resonances is enhanced whereas that between the spin-down ones is shrunk because of as shown in Fig. 2a, b. Meanwhile, the spin polarization p increases accordingly. If Δt is set to be Δt = t c, the spin-up and spin-down inter-dot tunneling coupling strengths are and respectively. Then the spin-up conductance has a finite value but meanwhile as the conduction channel for the spin-down electrons breaks off, which is shown by the dot-dashed lines in Fig. 2a, b. The spin orientation of the non-zero conductance can be readily reversed by tuning the direction of the magnetic field, which is applied on the tunnel junction between the dots, to set Δt = −t c .
where ɛ0 = ɛ1 = ɛ2. Since and the spin-down transmission regardless of the choice of λ. The spin-up conductance is composed of one broad Breit-Wigner and one asymmetric Fano resonance centered, respectively, at the bonding and antibonding states [18, 21]. Detail investigation of this spin-dependent Fano line-shape can be found in our previous papers and we do not discuss it anymore here. It should be indicated that the spin orientation of the nonzero conductance can be reversed by setting Δt = −t c and φ = −π/2 + 2n π with n is an integer. It is known that the Coulomb interaction in the QDs plays an important role and we now study if the spin filtering effect survives in the presence of it. Figure 4a shows that the conductance of the spin down electrons is still zero and that of the spin up shows typical Fano resonance. Due to the existence of the intra-dot Coulomb interaction, two resonances emerge in higher energy region. Moreover, the positions of the bonding and antibonding states can be readily exchanged by tuning the magnetic flux as shown in Fig. 4b, where φ is changed from π/2 to 5π/2. 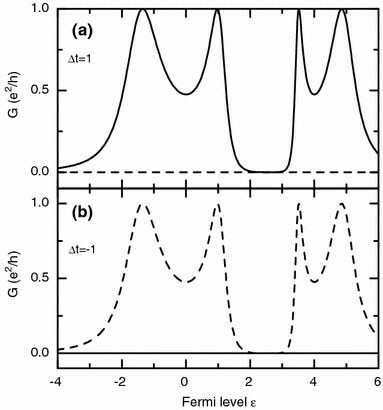 Since the Fano effect is a good probe for quantum phase coherence in mesoscopic structures, the tuning of its resonance position and the asymmetric tail direction is an important issue. 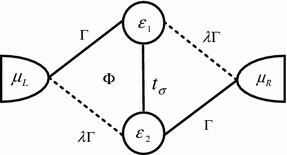 To date, much works have been devoted to this topic concerning both the charge and the spin-dependent Fano effect. But most previous works about the Fano effect in QDs ring ignored the Coulomb interaction , especially when the spin degree of freedom is considered [20, 21], and this limitation is supplemented here. In fact, to realize the RSOI in a tiny device such as the QDs is somewhat difficult, and then we study if the spin filtering effect can be found in the absence of it. In Fig. 5, we set ϕ R = 0 and plot the two spin components conductance by varying Δt and the magnetic flux-induced phase factor φ. Figure 5a shows that when Δt = t cand φ = π + 2n π withn is an integer, the conductance of the spin-up electrons still has finite value whereas that of the spin-down electrons is exactly zero. 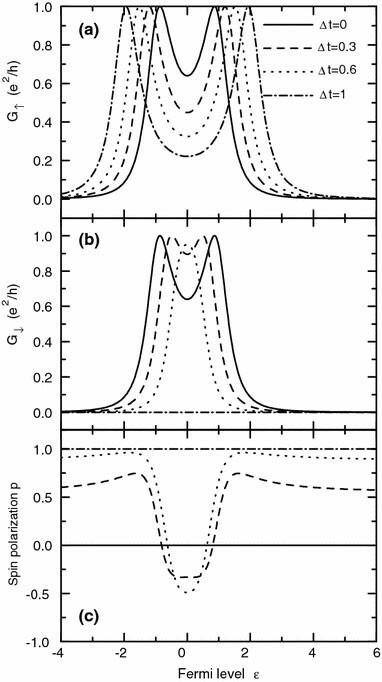 Moreover, to swap the spin direction of the non-zero conductance, one can simply tune Δt fromt cto −t cwith unchanged magnetic flux as shown in Fig. 5b. 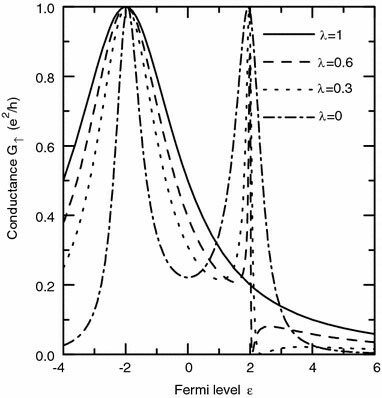 The peaks’ width and position of the non-zero conductance in Fig. 5a, b are the same, indicating that one can flip the electron spin in the bonding and antibonding states without affecting its sate properties. In conclusion, we have investigated the spin filtering effect in a double QDs device, in which the two dots are coupled to external leads in a configuration transiting from serial-to-parallel geometry. We show that by properly adjusting the spin-dependent inter-dot tunneling coupling strengtht σ, a net spin-up or spin-down conductance can be obtained with or without the help of the RSOI and the magnetic flux. The spin direction of the non-zero conductance can be manipulated by varying the signs oft σ. The above means of spin control can be fulfilled for a fixed RSOI-induced phase factor, and then the QDs in the present system can be either a gated or a self-assembly one, making it easier to be realized in current experiments. This work was supported by the National Natural Science Foundation of China (Grant Nos. 10647101 and 10704011).